Whenever we facilitate activities for our visitors, we thrive to support the kind of learning we describe in our Tinkering Learning dimensions framework. We often reflect on the drop-in workshops we do day to day in the tinkering studio with a specific aspect of the LDs in mind. One of the qualities I value a great deal in tinkering activities is that learners are encouraged to work without a blueprint whenever possible. I think that this process of "inventing" instead of copying fosters a deeper understanding of the topic at hand. Making automata always has been a challenging activity in that regard. Different movements are achieved with different mechanisms and as we show examples to introduce the activity, participants often pick a certain mechanism - "up and down" for example - and then start to copy the parts involved in the mechanism, carefully looking at the shape and material of each part, but not necessarily their purposes. 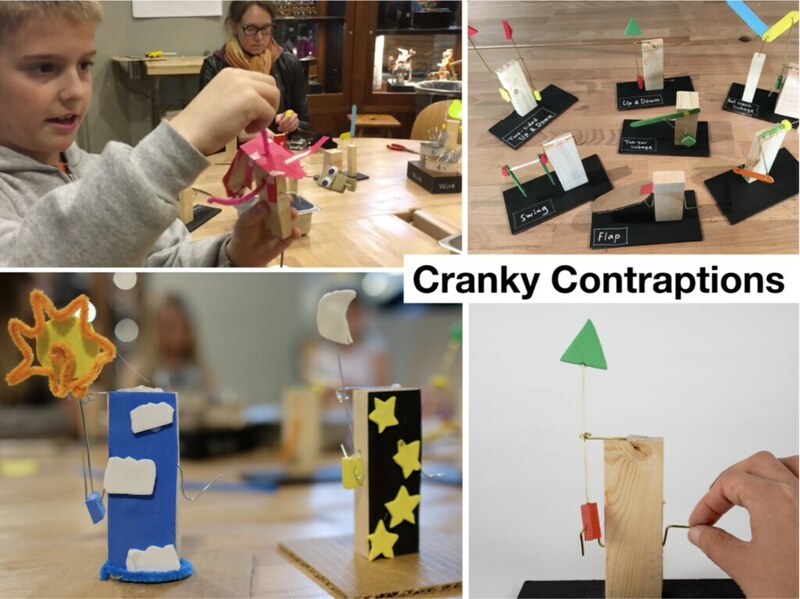 We recently were inspired by automata maker Keith Newstead, a visiting artist at the Tinkering Studio, to change our facilitation approach to our "cranky contraptions" activity while using the same material set. 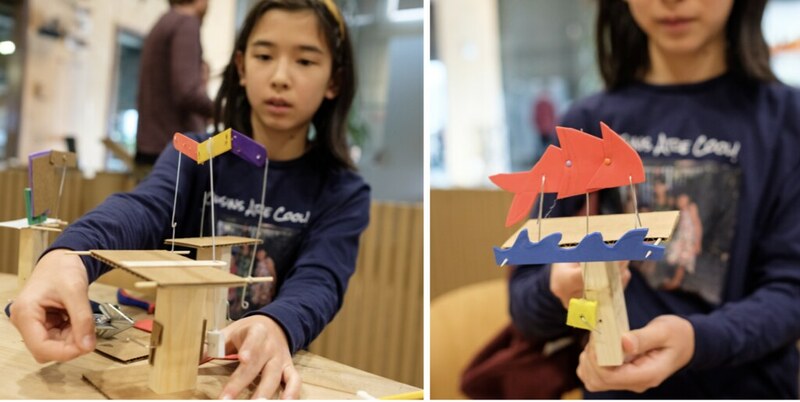 In the new version of the activity, we encourage visitors to adopt a process similar to the artist's: start by making a simple crank slider mechanism, create a character or puppet that has moving parts to it and attach it to the stick (slider) of the crank-slider mechanism. From that point, learners develop strategies specific to their contraption in order to make the limbs of the character move; this process is supported by facilitators and facilitated by playing with a number of sample mechanisms available on the table. What participants created when we took this different approach may look similar to the results of the previous approach at first blush, but the quality of the process felt different to me. Allows for deeper understanding, linkages exploring length, distances. My take on our reflections is that this version of the activity — while more challenging for educators to facilitate — has real potential to have learners develop a deeper understanding of linkages and mechanisms. This really shows that she is grappling with a newly learned concept, something she was able to figure out with her hands but hasn't learned the words to describe yet. Effie has some difficulty finding the right words when she talks about the wing and how it is moving differently from the body because it is constrained by the secondary wire. To me this really shows that she is grappling with a newly learned concept, something she was able to figure out with her hands but hasn't learned the words to describe yet. Facilitating automata-making in this new way — starting with a simple crank slider mechanism and then encouraging learners to work with linkages and constraints — has resulted in many interesting explorations, and I have enjoyed accompanying visitors in their process of figuring it out as they go along. My take-away for all activities involving explorations of mechanics is to carefully consider at what point in time knowledge about mechanisms is being introduced. It seems that getting engaged in making and immersed in one’s own project *before* examples of specific mechanisms are introduced sets the mind on a trajectory of inventing rather than copying. Our activity development process often starts with the exploration of a physical phenomenon, it often stretches over long periods of time and the development never stops even after an activity has been shared and documented many times. 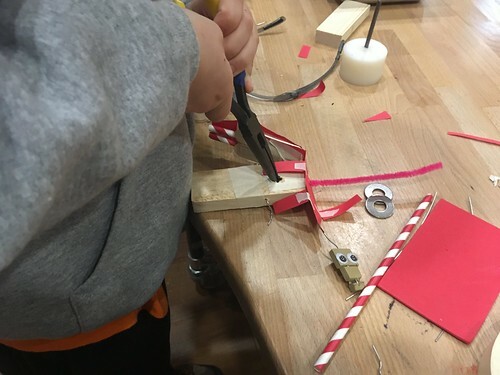 Activities continue to evolve as we try them out ourselves and with others which means every workshop we do with visitors in the Tinkering Studio also plays a role in our activity development. I will share some thoughts on the activity development work we are recently undertaking in an area we call Computational Tinkering (more background here). As part of our TiDA (Tinkering in the digital Age) project we are investigating interesting ways to combine computation and sound explorations. Mechanisms that make sounds and rhythms have often caught our attention. 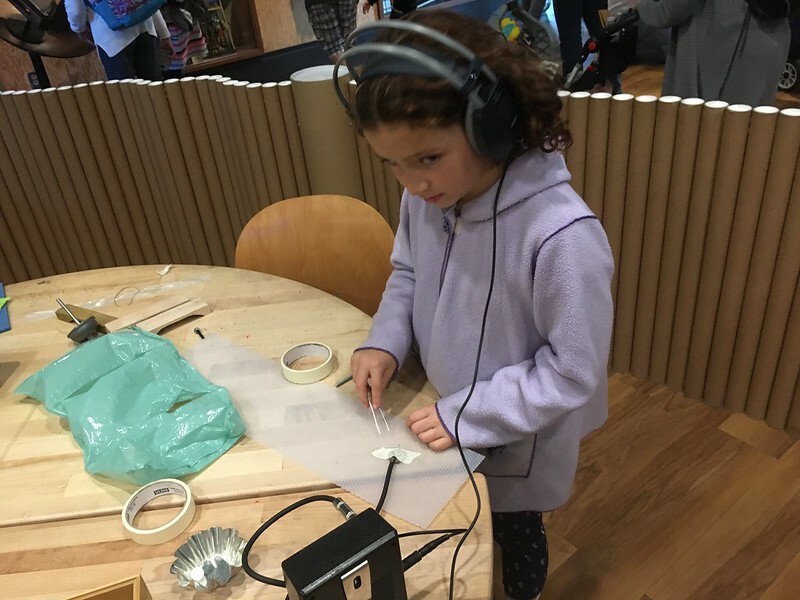 Inspired by artist's work (Pierre Bastien, O Grivo) that felt really in tune with the tinkering spirit, we decided to try our hand at making sound machines ourselves using everyday materials and easily accessible tools. We also learned a lot about interesting ways to use code and programming to control motors and other motion from our partners at (LEGO Idea Studio) during the last year. 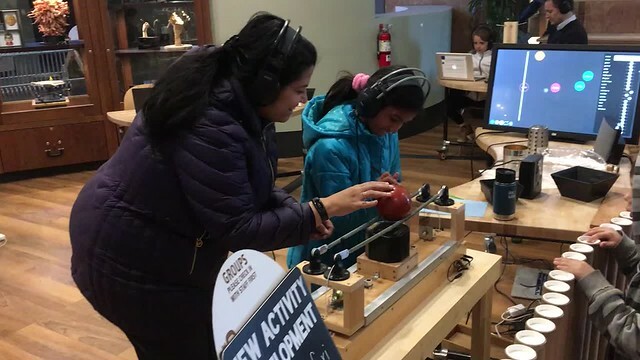 We decided to invite our visitors to explore coding with MITs Scratch software (Scratch) to activate a set of whimsical sound makers. During the first stage of activity development we put ourselves in the place of learners and spent time tinkering with a broad set of materials. Over a couple of months of intermittent group and individual tinkering sessions, we created a variety of sample programmable sound makers. Some simple, some more advanced, some silly and many of them driven by specific interests of our team members. 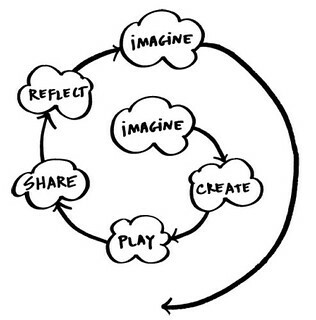 The process we went through as a small group to develop these examples and the activity idea that goes with them could be described as an iterative process where we go through these stages: Imagine - Create - Play - Share - Reflect. The repetition of this cycle has been described by MIT professor Mitch Resnick as the Creative Learning Spiral. Often there is a blurry mix of creating, sharing and reflecting, but these elements are all present when our group engages with materials following their ideas within a broad theme, like our Sound Making Machines. 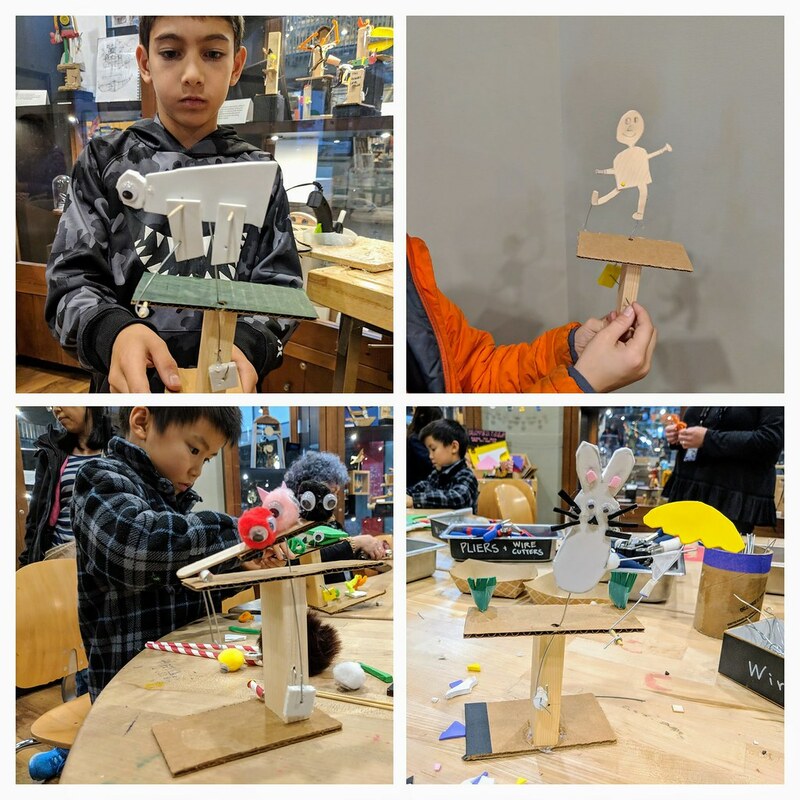 One of our goals at the Tinkering Studio is to let visitors experience that same creative learning process alongside with us and that's why we like to share activity prototypes with visitors as soon as possible. In other words, we include visitors in our prototyping process by sharing half-baked ideas with them. WHAT DOES PROTOTYPING WITH VISITORS LOOK LIKE? 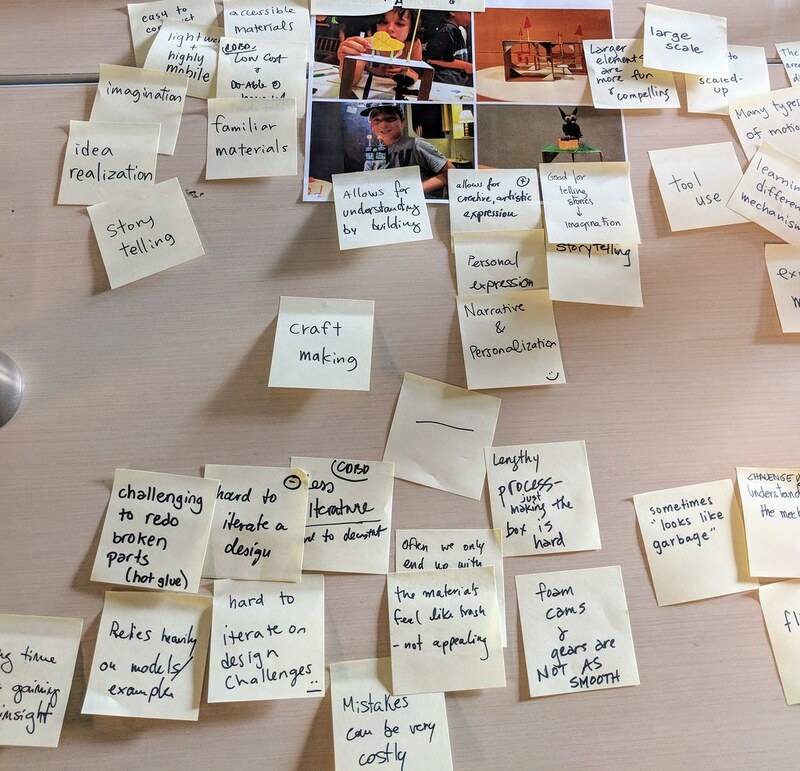 As we start prototyping new activities with our visitors, we provide an open exploration space for them that allows them to define their own goals and explorations while they are focused on a theme. The invitation we extended to introduce visitors to this activity was “Coding with Scratch to activate a set of whimsical sound makers”. During the early stages of our prototyping, we have a certain intuition about what might be interesting and rewarding to explore, but our process relies even more on observing visitors, carefully noting which materials, examples and explorations they find interesting and delightful and what leads them to tinker and develop their own goals and questions. Once we see what visitors engage in, we let those observations guide us to shape the activity. We might learn about particularly fruitful areas within the exploration space or find that there are even richer avenues for tinkering if we shift the space towards an adjacent topic of exploration. Whenever we see visitors take the activity in an interesting direction that aligns with our goals, we work on ways to support investigations in that area with materials and prompts that make it easier to get started and encourage digging deeper. Our first activity prototyping sessions were focused on experimentation with mechanisms. After working out a mechanism, visitors often wanted to add variation and sequence sounds of different instruments, however the single motor and limited code of the Scratch Junior software made it hard to turn individual sounds on or off and create sequences. After many other experiments, we transitioned to the full version of Scratch with 2 motors and a stage showing a visual along with the rhythm. 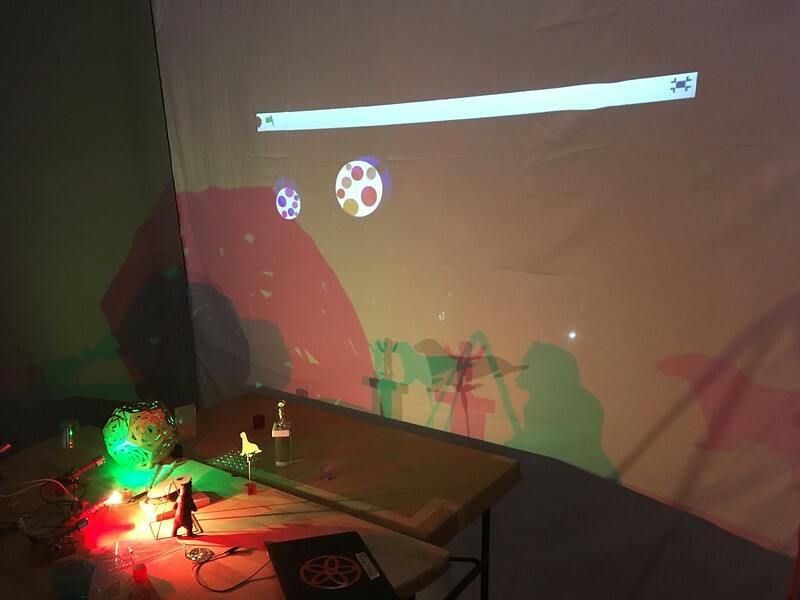 With this set up, we see more interest in combining different sounds, deeper explorations of code as well as collaborating with others to compose. In another recent version of the activity, we are using the sound machine examples together with Scratch software as an invitation to create "Sound Stories". 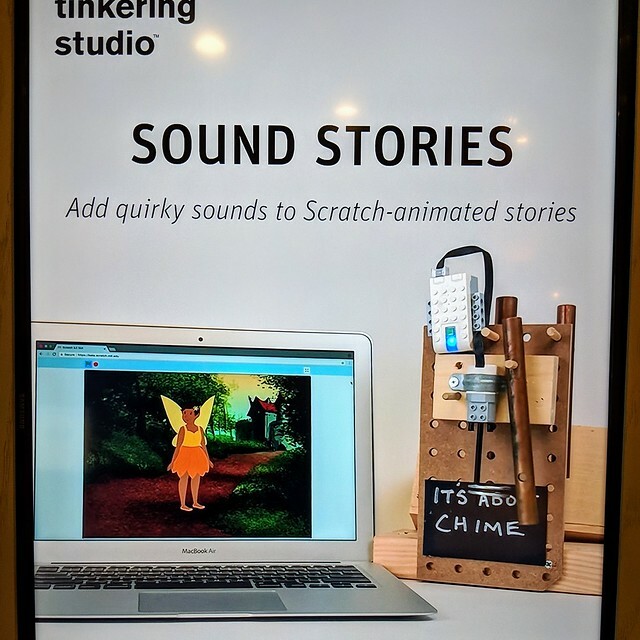 With this new version of the activity, we encourage visitors to find a visual or story that connects with the sound of the sound contraption they pick and create an animation on the virtual Scratch stage that accompanies the sound. Using WeDO distance sensors, visitors have the option to make their story interactive by programming it to respond to their hand movements. This visitor testing stage or better "prototyping with visitors" is where we spend most of our time and effort. 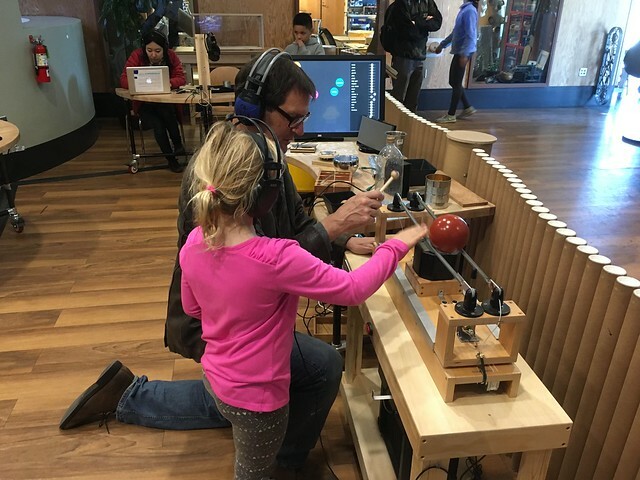 We typically take a couple of months developing each new activity with visitor input in our Tinkering Studio workshop in the Exploratorium. Based on our reflections and group discussions that follow the tinkering sessions with visitors, we implement small and sometimes big changes to the material set, starting points, environment and facilitation prompts before we take the activity to the next round of visitor testing. Through many cycles, we shift towards more of the rich investigations we are interested in. 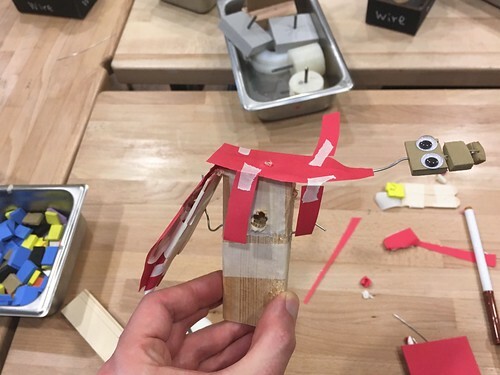 Since we started our first experiments, the original sound automata idea has generated a number of activity prototypes and new activity ideas which we will continue to evolve and document with visitors here at the Tinkering Studio and with our extended network of educators and Tinkering aficionados. After our initial Sound Safari sessions with visitors we decided to make adjustments to the workshop environment, tools and materials to contextualize and support the explorations we want to see. 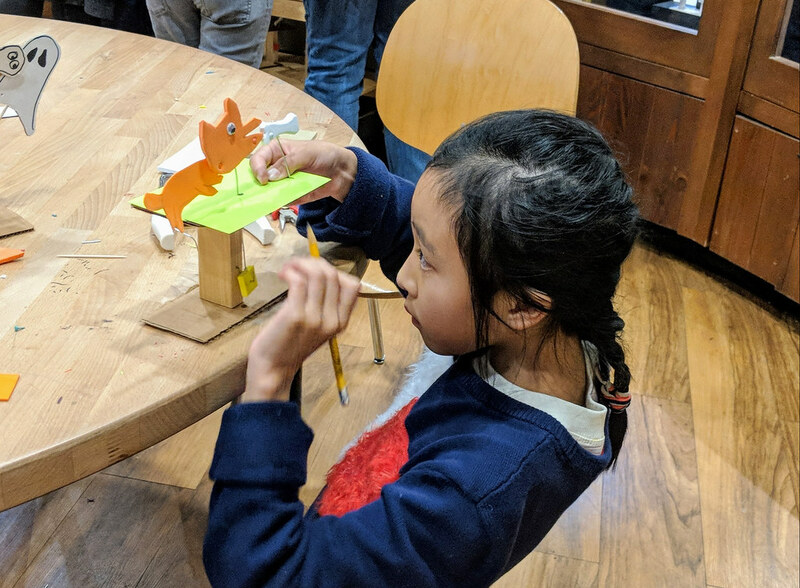 Making small changes and carefully observing how they affect the tinkering experience is a core part of our ongoing iterative activity design process. We always like to work with artists using their art pieces as inspiration and to immerse visitors in the exploration. For this environment we were lucky to get one of Bryan Day's sound sculptures loaned to the Tinkering Studio. 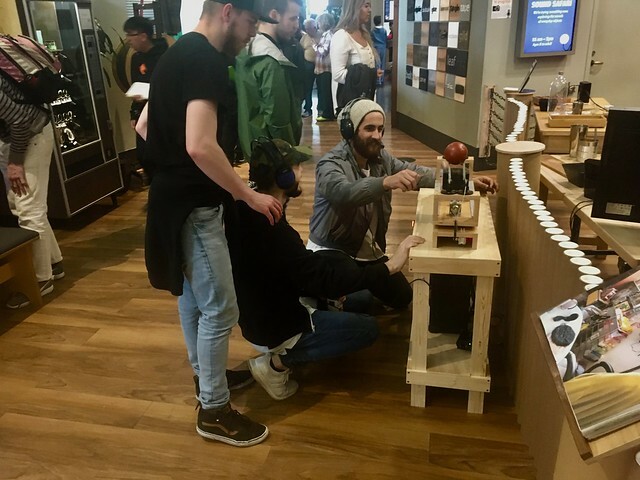 We placed the interactive sculpture near the entrance to the workshop area to introduce visitors to the idea of carefully investigating objects through sound as well as sound harvesting with pick-up microphones. By playing with the sound sculpture, visitors got the concept of amplifying and investigating otherwise inaudible sounds with pic-up microphones without much explanation by facilitators. A table with interesting and unusual materials and a hand held pic up mic with a speaker next to the art piece invited visitors to explore more, guided by their own interests. 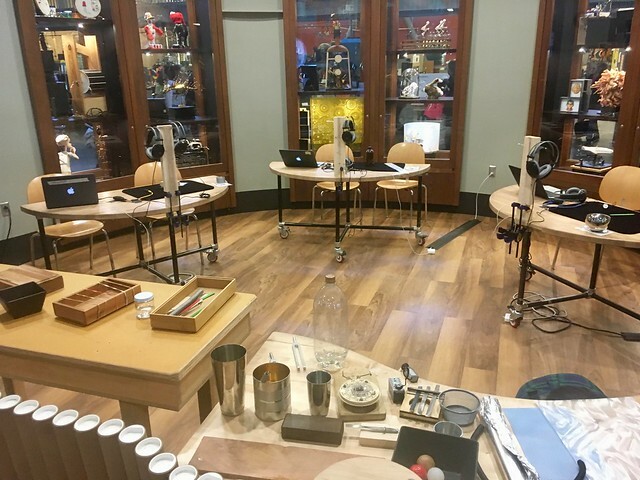 The starter station and art piece helped visitors become comfortable with the tools and materials and open up to the idea of working at their own recording station for a longer amount of time. During the first visitor tests we found people engrossed in exploring sounds but recording them wasn't interesting to them. 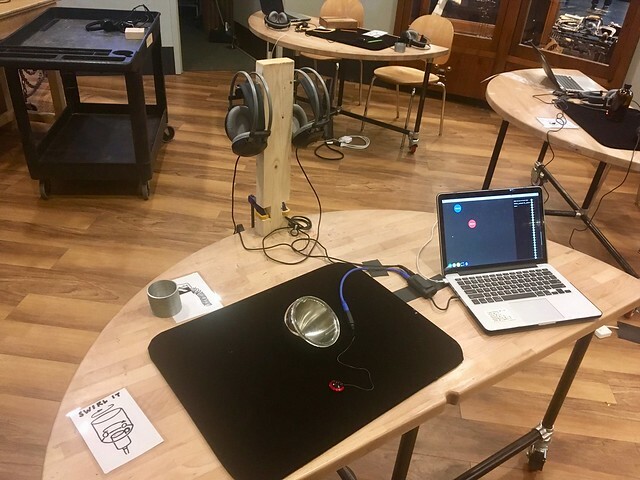 A new custom software by our collaborator Keina Konno set up on a recording station for two people significantly changed the way visitors were exploring sound. Just like the environment in the physical world, the software environment guides the investigation. In this case the software was set to record short 5 second sound samples, each sound was represented by a circle on the screen. This set up encouraged visitors to collect sound snippets and jump back and forth between investigating the object and recording. We saw a few visitors thoughtfully naming the sounds and arranging sounds on the screen and some made discoveries about combining sounds by playing them back at the same time. 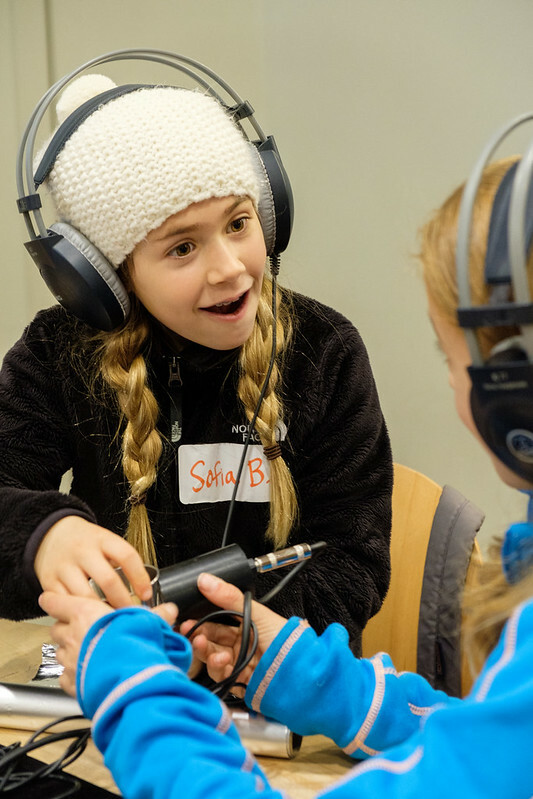 We also saw more complex experiments when visitors were working in groups of two, four hands help to arrange sound makers and position the microphone carefully to make small adjustments to the sounds. We would like to see more visitors create sound arrangements or even personal stories and sound collages. 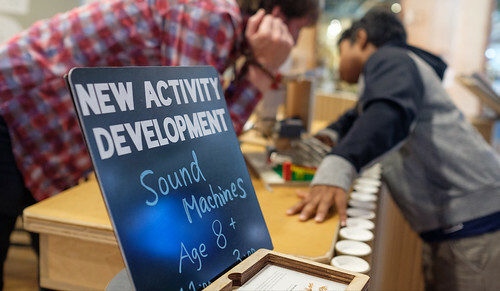 Our current tools and software don't quite support creativity with sound enough and we observed that most visitors couldn't sustain their engagement when they were done discovering new sounds. We will put effort towards creating context and tools for visitors to use their sounds in personally meaningful creations our next phase of prototyping. One of the strong suites of Sound Safari that remains through the different iterations is that younger visitors are immediately engaged and motivated to explore, often driving the exploration while collaborating with their parents. We would like to build on this and revisit the idea of sound harvesting, maybe with a simple software tool that allows to capture video or images together with sound recordings. We love to ground our activities in the direct investigation of phenomena. 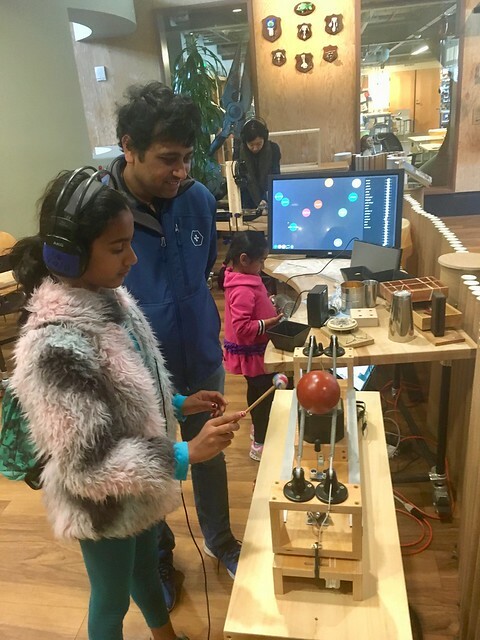 Recently, we have learned a lot about how to engage visitors in deep explorations of sounds made with everyday objects amplified with contact microphones. To read about our initial sound experiments with visitors, check out Luigi's blog post. 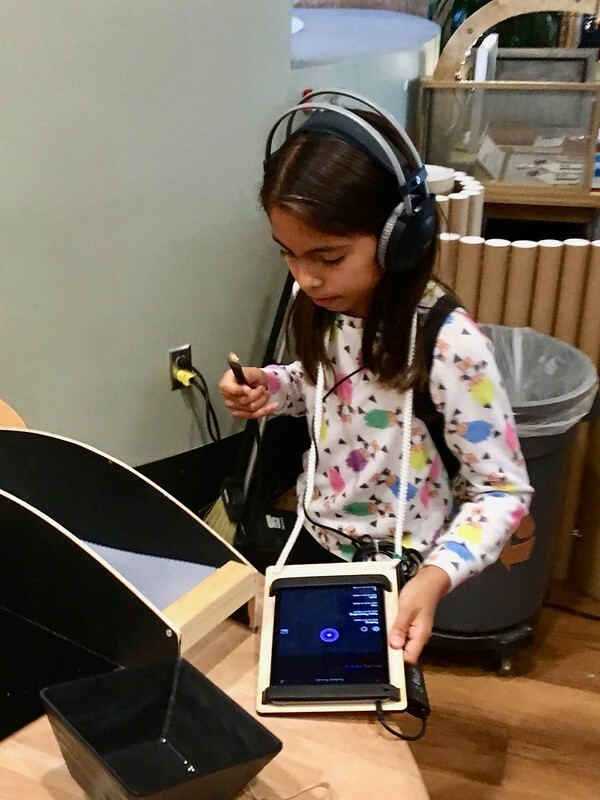 To allow participants to study everyday sounds in a playful way, we developed a new tool, a portable contact microphone with an IPad amplifier and headphones. Visitors can use this contact mic like a stethoscope to closely listen to otherwise inaudible sounds. We often describe it as a magnifying glass for sound. 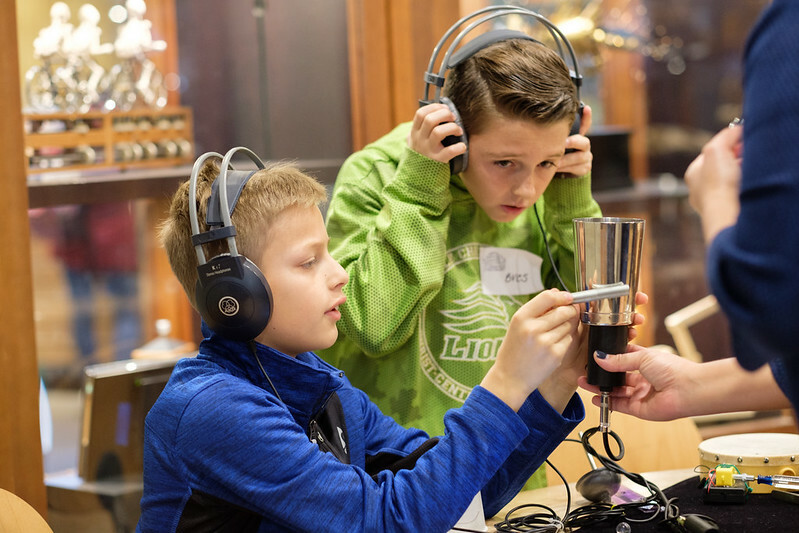 We observed a lot of curiosity and delight as visitors went on a "Sound Safari" to discover and record unexpected sounds from everyday materials. 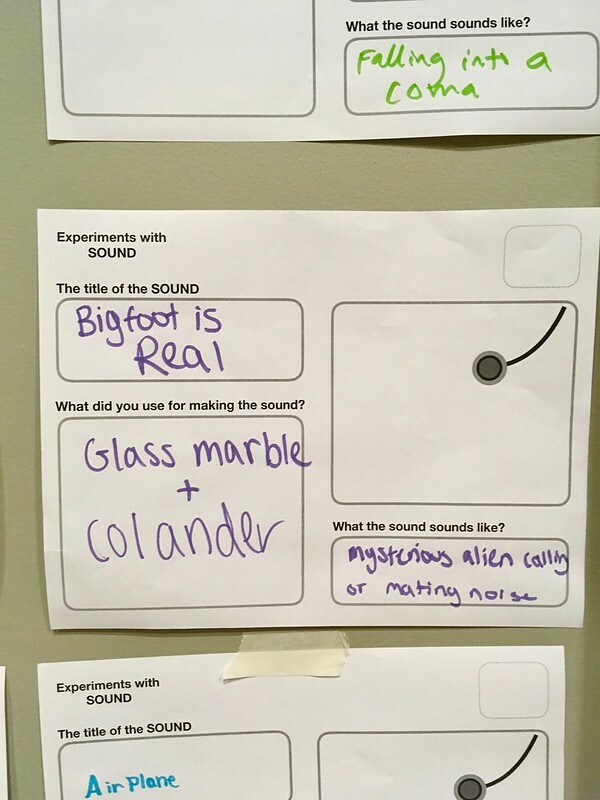 Our desire to better understand what visitors are thinking when they deeply investigate sounds from specific materials lead us to this documentation sheet. We uncovered that sounds were often described in imaginative and personally meaningful ways by visitors. We also overheard some visitors talking about stories derived from sounds they recorded. Since it's conducive to the tinkering process to share and build on the ideas of others, we wanted to make the sound recordings sharable between participants. On a small scale, we found that working in pairs with headphones makes for great collaborations and supports the exchange of ideas. However, it was challenging to share sounds this way with facilitators and the recordings themselves needed a home to be stored and remixed. 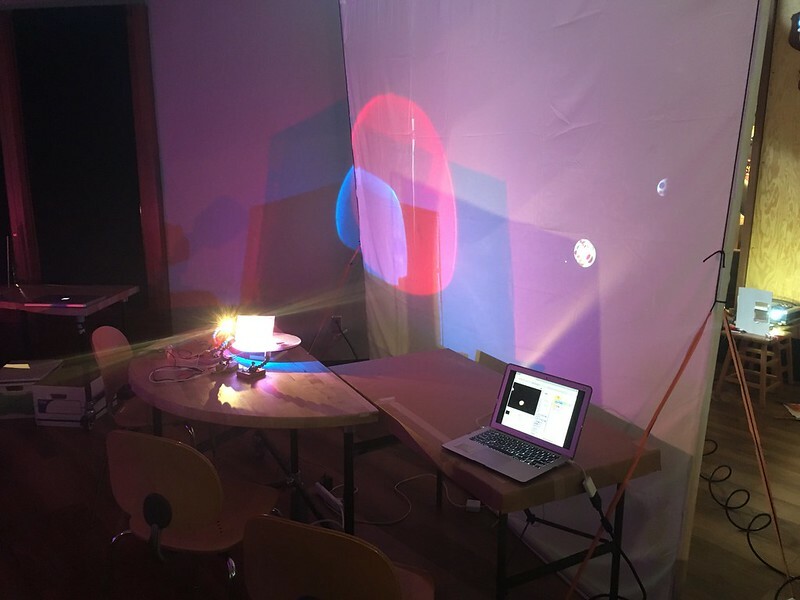 Keina Konno a media artist and currently visiting artist at the Tinkering Studio conceived of an app that visually represents recorded sounds in a "sound field". She dove right into creating a prototype and we've since tried out different versions with our visitors. 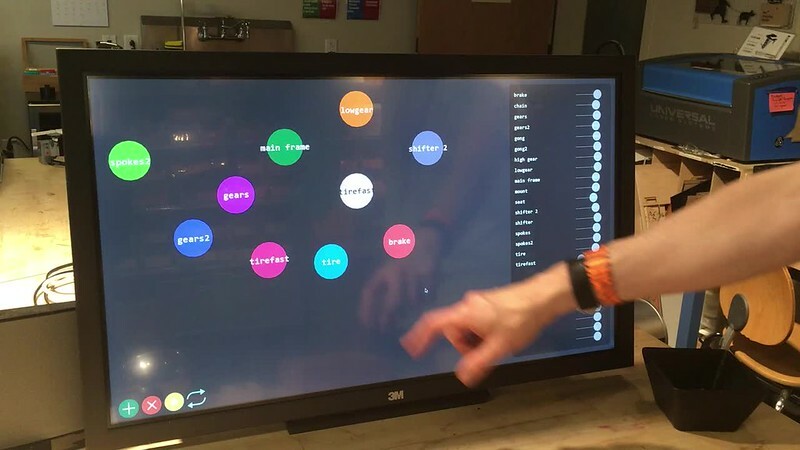 The screen becomes populated with sounds recorded during the workshop and visitors can share, combine and compare sounds on the touch screen monitor. This video shows a collection of sounds that were all recorded from Lianna's bicycle during a 45 minute long sound safari recording session. 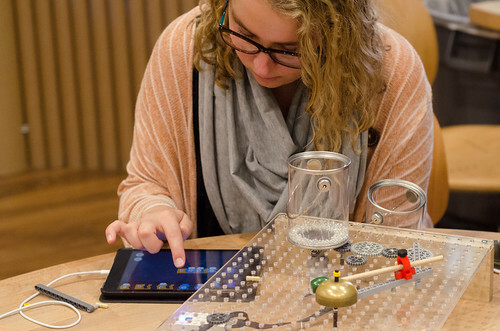 Good tinkering activities invite participants to explore a topic and in the process develop their own path of understanding and their own ideas for projects. During the next phase of activity development, we will focus on adding context that encourages creating personally meaningful projects that incorporate the recorded sounds. As we often do as part of our R&D process, we invite our team and collaborators to create projects based on their own interests. As we all create and share our own sound-based creations over the next couple of weeks and months, we will move toward understanding the core concept of the activity and then decide on how to frame it to visitors. For a start we are thinking of sound collages, visual animations that incorporate sounds using the Scratch visual programming platform, sound sequencers similar to Eric Rosenbaum's MmmTsss that the sounds can be added to, and a collaborative "sound wall" where visitors contribute their sounds and trigger other sounds by touch or dancing. As we transition to developing activities using recorded sounds as a material for story telling and composing, we will look more closely at computational thinking concepts and practices present in the activities, such as sequencing, modularizing, abstracting and iterating. 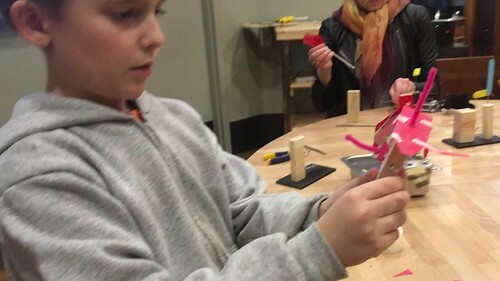 A moment that got me excited about Cranky Contraptions, a new tinkering activity, was when one of our visitors set his own goals during a recent prototyping session. As we design tinkering activities we typically set up a sand box or play field for participants and we love to see them come up with unique ideas within that play field. After 30 minutes of tinkering and building a dragon automaton, Henry (name changed to protect visitor's privacy), one of our visitors, shared an idea that he had come up with with me. His idea was unique from any example we had provided as inspiration. He had a very clear vision not only of what he wanted to do, but also how he wanted to do it. Here is a video of him describing his design after he finished the first part of his build. It wasn't possible to finish the project within the time he had left, but that didn’t matter at all. We started with the project keeping in mind that he could finish at home. Our interaction started with Henry asking me how we could put a big hole into the top of his wooden block. I told him that we could get a drill and do it, and said that I was curious to hear what he needed the hole for. He explained that he wanted to feed a string through the block to add wings to his dragon that could be pulled up by a mechanism and then fall down again pulled by a weight (washer). As he described this to me in more detail, he realized that the hole would have to go around a corner (from the top of the block to the side). He suggested drilling diagonally through the block. I told him that I had success achieving the same by drilling two holes at a 90 degree angle and he agreed on that design. Henry then learned to use our power drill and to his and my surprise we managed to put two holes in the block without damaging the contraption he had already build. He managed to pull a pipe cleaner through and went on to make the wings and figure out more details as he continued to add to his project. It's always special when we get to see visitors defining their own goals, deeply engaged with the activity, and grappling with problems in a profound way. What I like most is when they become the expert and driver of the exploration and I as a facilitator become a co-learner. 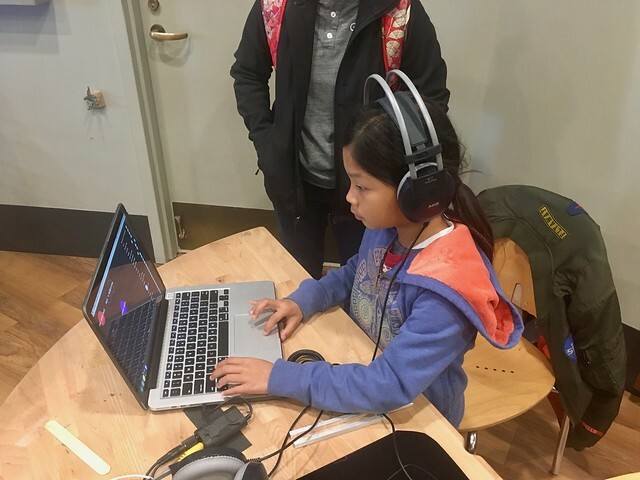 We have been prototyping new computational tinkering activities that explore sound during the past 4 months, working collaboratively with our partners from the MIT Lifelong Kindergarten group and the LEGO Idea Studio. 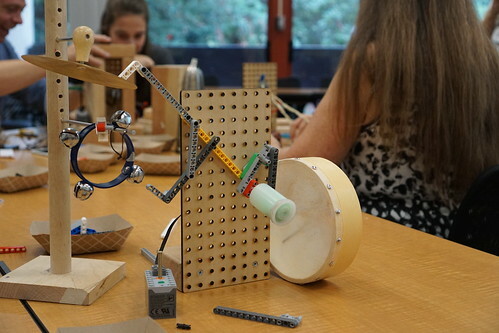 During our first round of activity development with mechanisms and sound, back in Spring 2016, we came up with an activity we called "Kinetic Musicale" or "Robot Orchestra" in the early stages. We saw a lot of iteration as visitors were creating their "sound machines", however, deep investigations were focused mainly on mechanisms whereas "sound" felt more like a hook to draw people in. A couple of months ago we picked up the topic of sound again, this time as part of our Computational Tinkering work (tinkering with computation in the digital world combined with tinkering in the real world). 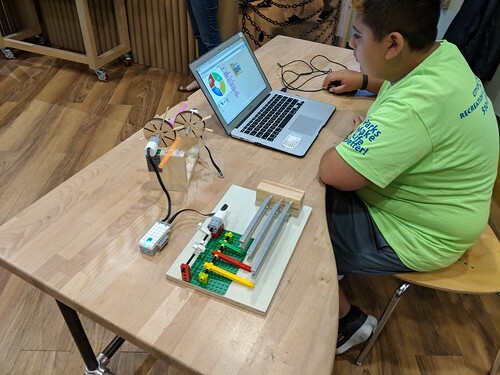 Our collaborators at LEGO Idea Studio started building small motorized sound making devices with LEGO WeDo and shared their experiments on Twitter. Unlike during our first explorations of sound and mechanisms, we had a clear intention that the mechanisms could be played together, controlled by a machine or computer. This is one of the early prototypes. The Idea Studio called this "Sound Circles"
This prototype from Amos and Liam at Idea Studio sparked a number of interesting new experiments and discussions about concepts of computation such as loops, events, sequences and physical computing in general. We were also reminded of some of the challenges we faced investigating sound during our first explorations with "Kinetic Musicale". Namely that participants wanted to play their "sound machines" together, but it was hard to do this without a common beat. 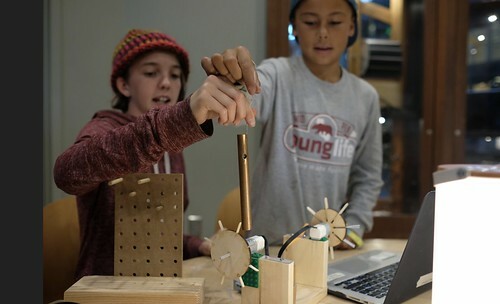 (https://tinkering.exploratorium.edu/2016/05/12/lego-robotic-orchestra). 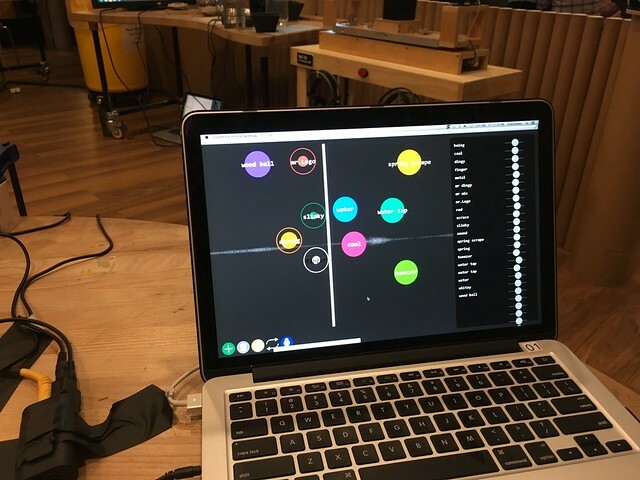 One of the ideas that our teams got excited about during this 2nd prototyping phase with computation involved was that a group of people can collaborate and contribute their sound makers to a larger system that controls the individual sounds and composes them together. Following this idea, we experimented with a few more prototypes in recent weeks. This is the next iteration of Sound Circles from the IdeaStudio, with more build-out sound elements or "Sound Tiles". Here is a clone with a different type of trigger mechanism (a spinning disk) that I made in response to the Idea Studio's Sound Circle at the Tinkering Studio. Since then we have had fun making more sound tiles controlled by Scratch code and LEGO WeDo. Each sound tile has a distance sensor and that way can be plugged into a larger system that controls it. Here's a particularly intriguing Sound Tile that "Hernán Lira", one of our visiting artists made. I love the variety we see in these explorations, and how Hernán's work can be tied into a system even though the material set and aesthetic is very different from some of the sound tiles we made. Now that we collaboratively made a variety of examples of "Sound Tiles", we will play with inventing systems that they can be plugged into. They could be played by a human conductor covering the distance sensors with their hands, triggered by a rotating mechanism, or even programmed by a drum similar to the mechanism used in mechanical music boxes. I am excited to invite visitors at the Tinkering Studio to come up with ways to trigger and combine sound tiles. Revisiting sound with a focus on computation while frequently sharing ideas and experiences with our partners at MIT Lifelong Kindergarten and the LEGO Idea Studio has lead to interesting remixing of ideas and inspired new directions. I particularly like that physical prototypes inspired by each other's ideas often took the work in a slightly different direction and served as jumping off points for the whole group to investigate new areas. It's always reassuring to see the same qualities of Tinkering that we value in our workshops present in our own prototyping process. Every once in a while I get into a particularly fulfilling path of exploration around a topic, one where the flow from inspiration to experimenting and back to researching feels effortless and natural. Last week got us into an interesting excursion around light projections. It started with a video artist in residence Becca Rose shared with me. 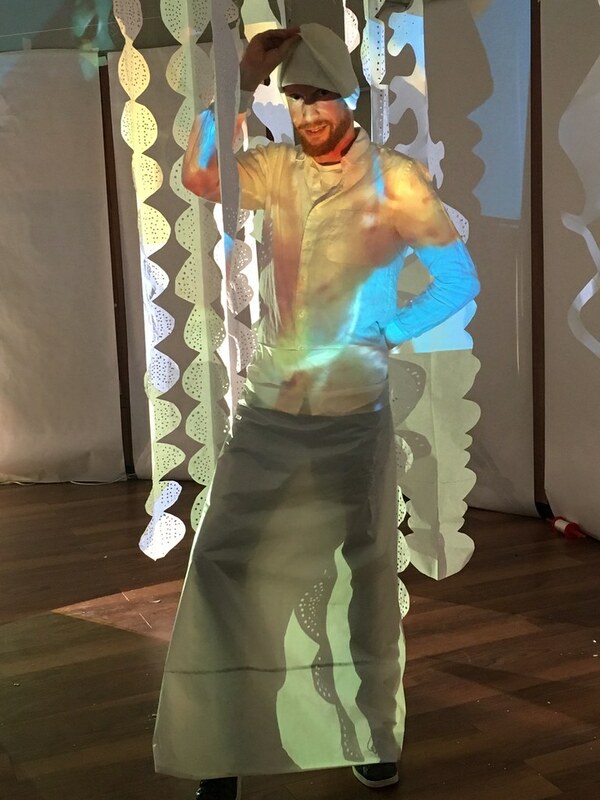 Inspired by the idea of using clothes as a projection surface, I decided to bring the white clothes I could find to work the next day to try and turn my body into a projection surface. 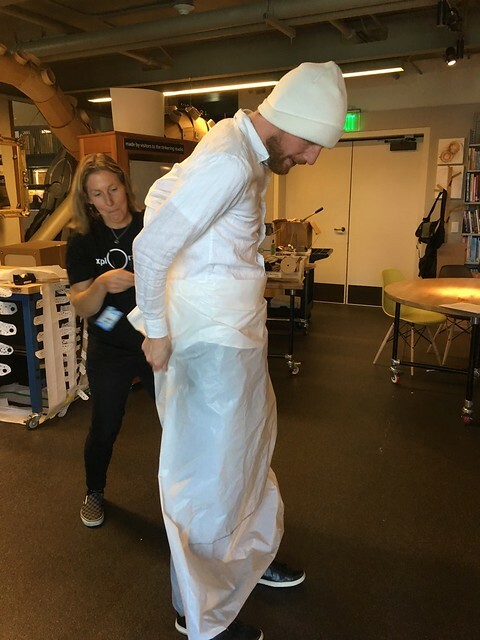 My colleagues helped improvise a sarong from a piece of white plastic foil to complete the costume. 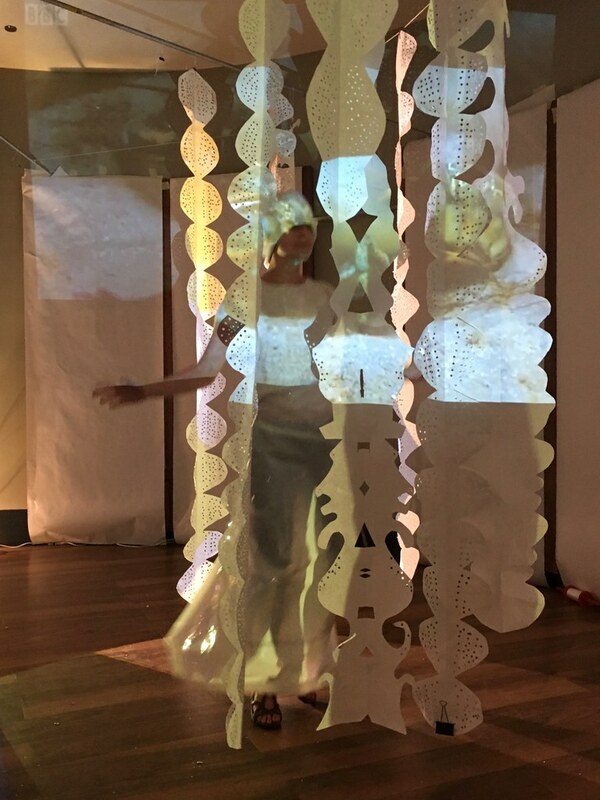 Deanna and I had a great time playing, experimenting and taking photos, sometimes hiding in the paper forest of Becca's installation, sometimes trying to catch a particularly beautiful part of the video footage Becca projected. 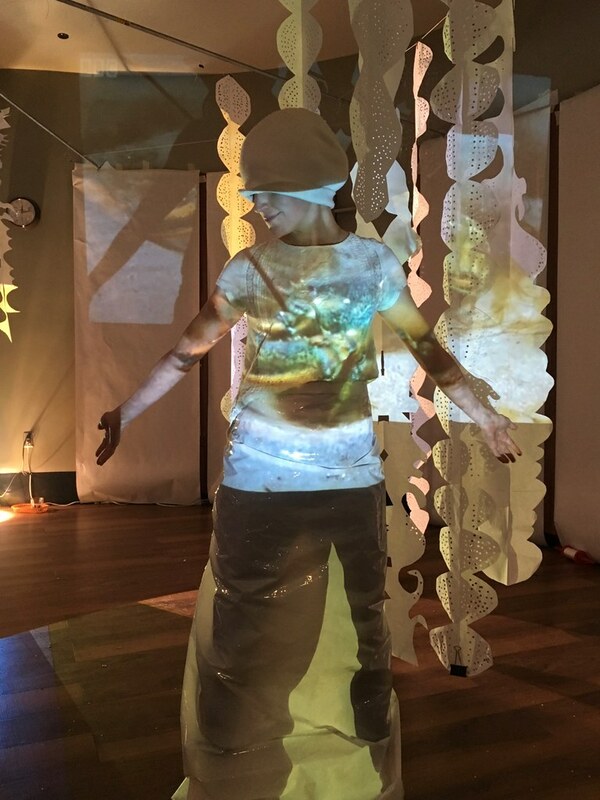 After I shared our exploration via Twitter, a friend and collaborator pointed out that our own Exploratorium explainers had experimented with the idea of the body as a projection surface years ago, even adding reflective material to the mix. I don't have any concrete plans to take this exploration further, but I feel the satisfaction of understanding light projections in yet another way and having added more techniques for tinkering with light and shadows to my repertoire. 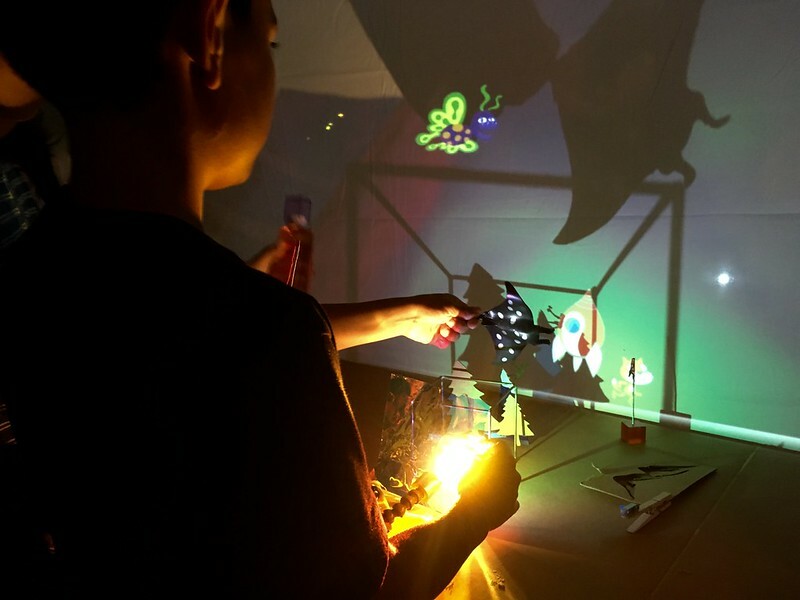 We have been exploring ways to add programming and computation to our light play tinkering activity during the last couple of months. Our experiments have mainly been focused on controlling lights and motors through programming, but we always allow for plenty of time to follow different paths within a theme and explore tangential ideas. One of my recent prototyping adventures was inspired by the idea to directly mesh computer sprites with the beautiful light patterns that we see visitors create with light play. I had learned a little about overlay projection techniques due to my interest in the beautiful artwork of Miwa Matreyeck, and knew that a combination of front and back projection might work to combine light play and Scratch on the same screen. A first prototype came to life 10 days ago as part of our Scratch day event in the Tinkering Studio. 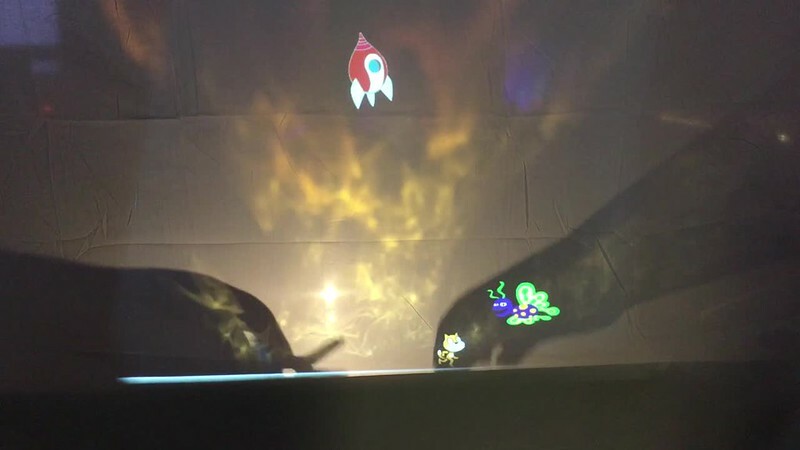 We improvised a front/back projection set-up with a projector connected to a laptop and a white fabric sheet in a PVC tube frame as a screen. After we figured out alignment and blocked the unwanted part of the computer screen with a cardboard template, digital and analogue projection merged almost seamless. I am encouraged by this first experiment and feel like there is a lot of potential for this type of set-up. The combined projection amounts to much more than the sum of its parts and it feels really satisfying to create light and shadow worlds with moving Scratch sprites, I discovered that often what is hard to achieve with Scratch code is easy to do in the analogue world and vice versa. 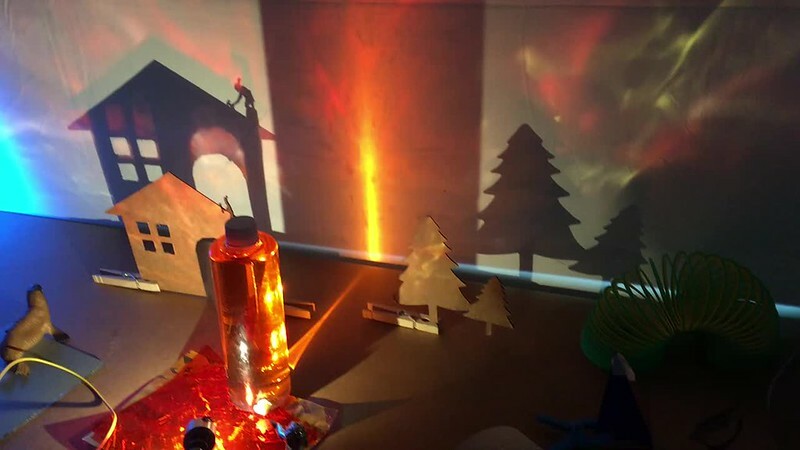 One of the more compelling ideas so far is to prompt visitors to create inspiring and aesthetically beautiful static environments with lights and shadows and bring the environments to life with movement and stories via programmed scratch sprites. The neighbouring pier next to the Exploratorium happens to be the headquarters of Instructables, an online community focused on all forms of making and crafting. My partner and I were fortunate to be accepted to an artist residency at Instructables, a program focused on using their state of the art machine shop (Instructables AIR program). Part of what we’re doing in our residency is experimenting with different techniques, with the intention of incorporating those discoveries into our fabrication repertoire. We like to let the inherent properties or characteristics of materials inform our work so will push on things to see what they do when treated in different ways. Early on we hit on the idea of using the waterjet machine to cut very thick, dense wool felt which is normally used for industrial applications. Felt is an amazing material, and has physical properties unlike anything else. We had tried using a laser cutter, but when you cut wool felt with a laser it smells like burned hair, and you can’t cut really dense, ½” thick material. Waterjet cutting seemed an interesting alternative, potentially clearing a path to digital fabrication using big sheets of felt. The result is even better than we imagined -- the cut edge is nice and crisp, and there’s a really satisfying tension between the machined quality of those edges and the overall softness of the material. FeltWaterjetVideo from The Tinkering Studio on Vimeo. The water cut right through the felt and the peg board we used as a sacrificial mounting surface. After peeling off the protective tape, we held very precisely cut pieces of steaming hot, soaking wet felt in our hands. The whole process was fascinating, and popping the little felt shapes out of the surrounding material was tremendously satisfying. The first thing we did with this new technique was build a vase out of layered felt. Check out the all the steps from design to assembly here. The rounded form was a good test of the layering concept and resulted in an enjoyable, enigmatic object. People can’t tell what it's made of when they first see it, and are nicely surprised once they figure it out. We've continued experimenting, and are learning about the capabilities of the machine and the software used to interface with it. We've made some small shapes we plan to use in jewelry pieces, and are working on a proposal for a more ambitious project we hope to execute this fall. 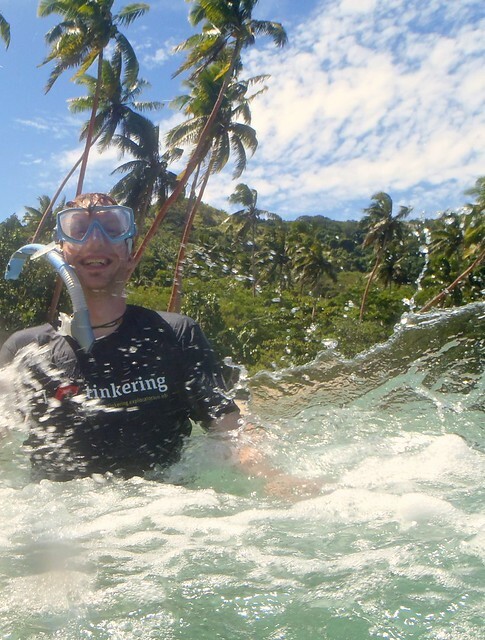 I am in Dolphin Bay on the island of Vanua Levu, Fiji. I (hot glue gun) Tinkering and I (heart) Snorkeling!